I am hard at work on a new item that we will hopefully be selling later this fall. It is weird and different and involves a lot of Fuzzys. Cross your fingers for this one, team. Trust me! It didn't occur to me that people would think of Carlyle when I "wrote" the strip, but it did as soon as I was actually drawing it. And that was fine with me! I love the extra hidden weight it gives to Fuzzy's "Are you..." set-up line... if you are a long-time reader, anyway! I guess I am just a cruel person. I have absolutely no idea what that is! So... maybe. No, it's just a regular car. So you're right! When you put it that way, it is kind of weird. Maybe that's why Sin finds driving so confusing. Sin also eats through his suit sometimes. Kinda gross! I have! 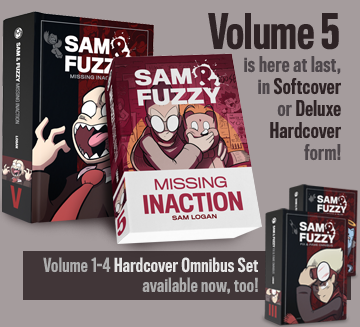 Over the years, as Sam and Fuzzy has become an actual proper job, I've been able to devote more time to it. But the end result has ultimately been longer and more elaborately drawn comics, rather than more frequent updates. Especially now that it's largely a story-driven comic, I feel like having larger and more substantial updates, rather than shorter but more frequent ones, makes for a more satisfying reading experience. Now, to be fair, I do also have other projects -- like making children's science magazines! -- competing for my time. But to be honest, even if I didn't, I think I'd be more likely to try launching a second comic or other project than to double up on Sam and Fuzzy. I don't know... I guess I just feel like drawing the equivalent of 300+ printed pages of Sam and Fuzzy every year is probably about the right amount. And it's fun to have different things to work on, to keep your brain sharp and avoid getting burned out. Variety is the spice of life, or whatever! All right! That concludes our regular broadcast week. Come back on Monday for more comics, team! Transformer? Or talking car? These are the kind of relatable, real-world quandaries we deal with every day in Sam and Fuzzy. Man, team, I am working on some really fun new swag to unleash for the ever-expanding "holiday season". I could be wrong, but I think I might have just put the finishing touches on my best t-shirt design ever. And we've got some experimental new, non-t-shirty stuff lined up, too, so... anticipate! I'm also working on the first of the Sam and Fuzzy Are Very Famous Book Club bonus packs, which will be emailing out later this month. (For those of you who are new around these parts, the Book Club bonus packs are bundles of free desktops, comics and other digital goodies that I periodically send out to everyone who has picked up our latest book.) 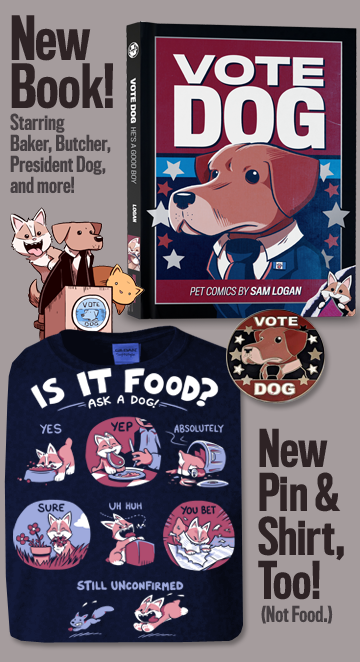 Among other things, this bundle will include the first few pages of an abandoned Sam and Fuzzy story from nearly ten years ago that was going to be about Fuzzy... becoming a sitcom star. At least I got there eventually!